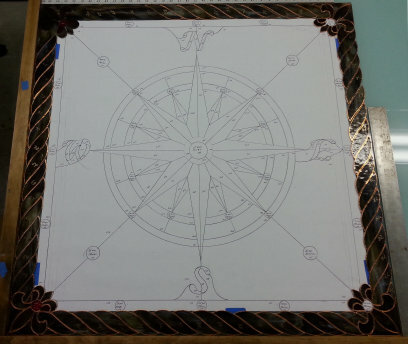 Drawing with the glass for the rope border cut out. 8-26-2014 Drawing with the glass for the rope border cut out. 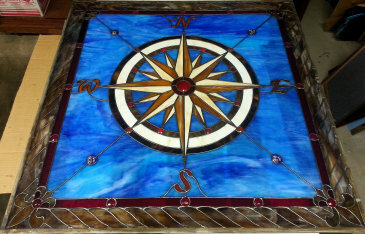 For decades I have wanted to build a compass rose in stained glass. Never could get any traction on the project.... I had accumulated every drawing I could find, but just couldn't get started. One hot August day.... just did it..... went to my work shop and didn't quit until it was drawn! I'd like to believe I was inspired..... but sometimes we just do things because we are frustrated with our own procrastination! 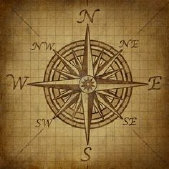 A compass rose, sometimes called a windrose, is the figure on a compass, map, nautical chart or monument used to display the orientation of the cardinal directions—North, East, South and West—and their intermediate points. 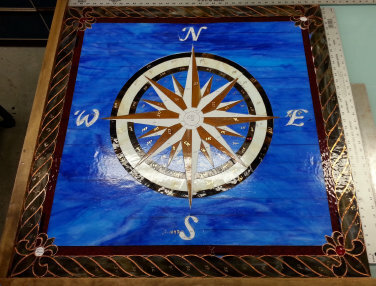 Today, the idea of a compass rose is found on, or featured in, almost all navigation systems, including nautical charts, global-positioning systems (GPS), and similar equipment and devices. (Wikipedia). 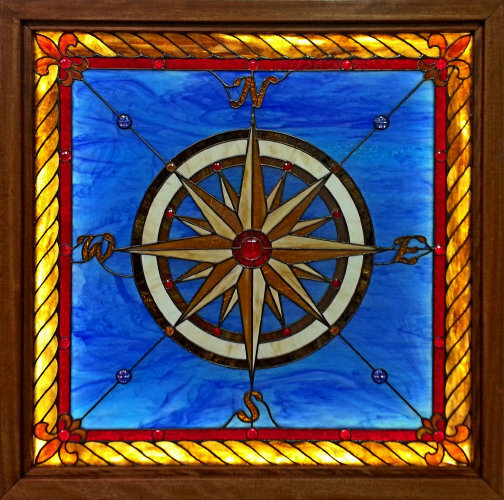 Classic compass rose designs go back to Greek and Roman times. 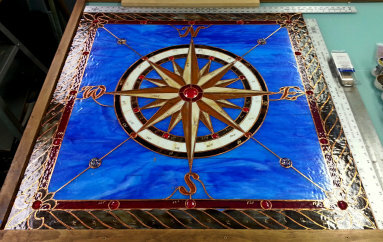 The finished stained glass window measured about 39" x 39". 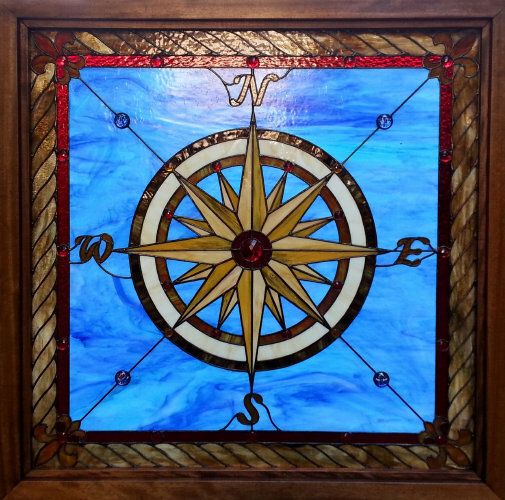 Rather than frame and hang in a window, I decided to build an internally lit frame or lightbox so that the window could be hung on an interior wall and lit when needed. A friend gave me some beautiful mahogany boards that I cut into 2" x 3" boards. I created a channel around the inside back to add about 15' of 12 volt LED strip lighting. On the back I installed a thin plywood backboard covered with crinkled aluminum foil so that the internal lighting would be reflected around inside the lightbox. 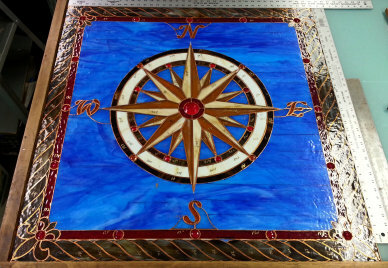 The warm white LED lighting uses only about 24 watts, yet privides plenty of light to make the stained glass glow. 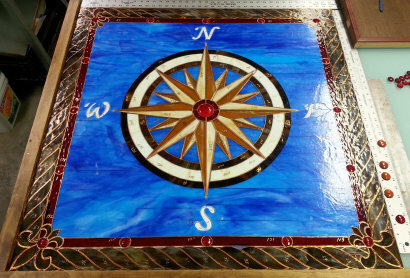 The finished stained and varnished red mahogany frame brings the total window size to 43" x 43". 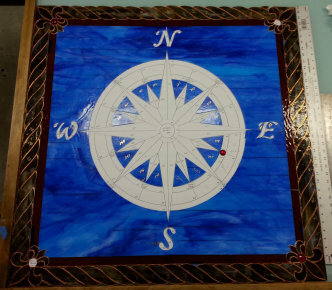 Dean's Compass Rose was completed in October 2014 and contains 280 pieces of glass.